Allows you to assign up to 5 locations to teleport to/from. Please do not upload my file to any other sites. Feel free to convert my file to work with other games if you want, just give me some credit please. 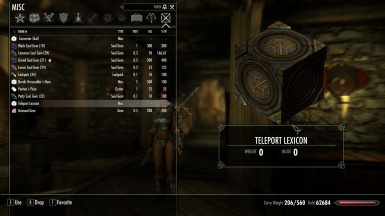 If you feel there is a major bug that you could fix, or that you could improve upon the features of my mod in some other way, go ahead and make them and upload it as your own - again, just give me some credit for any of my original work that you used. Are there places you find yourself visiting again, and again? Do you like to have multiple player homes, but hate having to travel to each one? Do you dislike the built-in fast travel, but want a way to get places that's faster than riding your horse or taking the carriage? If so, then this mod is for you. (i.e. Reassigning the first location to a new location will overwrite it). Chest. This chest will turn any items placed in it into their base* gold value after being closed.
! !FAIR WARNING!! -Don't put anything in the chest that you want to keep - JUST DON'T! value of items based on their base, non/un-enchanted, forms. Installation should be a fairly painless task, whether you prefer to install using a Mod Manager utility such as Nexus Mod Manager or if you manually install. Click the "Download with Manager" button on the Skyrim Nexus page. -There shouldn't be anything that needs overwriting, unless another of your mods has files with conflicting file names. As a final installation note - It is always good practice to run LOOT after adding any mod to your load order. Load order shouldn't make a difference for this, feel free to place it wherever you want or where LOOT places it. It shouldn't make a difference when you uninstall this mod, as far as I know.